This is the full kit minus the series D 3 blade blade. Buy this one if you already have a series D fan blade installed. (please note that earlier 3 blade fans will eventually break - it must be "D") If you need a series D fan blade, buy the full kit instead. Many people complain that the Mach 8 low profile air conditioner fitted to some RVs and travel trailers is still too loud on the outside. We performed some tests on a pair of donated Mach 8 units that had been removed from Casita travel trailers (and replaced with Mach 1 units). There are many reasons why these units are loud, but we have to limit our solution to the major items that can be addressed with the unit on the roof. These are the problems that we can fix. The external fans runs too fast. The external fan does not change speed between hi/lo. The Series "D" 3 blade fan. (not included) If you need this go here instead. This the heart of the fix. 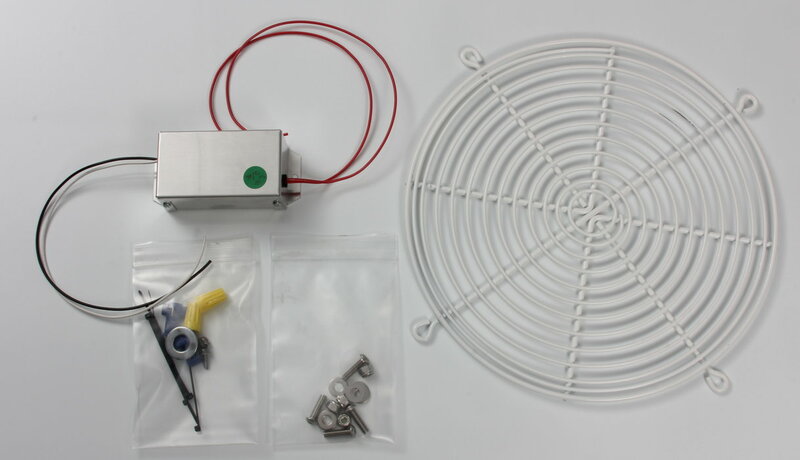 This slows the fan down to a speed that gives the same airflow as the original 6 blade fan. It also changes the speed between hi and lo. Installing the speed controller box involves splicing 4 wires into the existing wiring harness under the A/C cover on the roof, then screwing the new box down with 2 self-tapping screws. The A/C cover is held down with 4 screws and all work can be done from the rear right corner of the roof. Installing the controller involves many dangers but we are all adults here and you are sensible enough to asses the risk for yourselves. If you are not comfortable working from a ladder on electrical connections this is not for you. While you have the cover off - slice off the plastic grille with a box cutter and bolt this one on in its place. Custom made to reduce noise and turbulence on the outgoing air stream. White or Black powder coated grille and stainless steel hardware supplied. FedEx Ground Shipping (lower 48): $19.95. Canadian Customers: Please read the FAQs page for ordering info.